itsAlyx: To the Germans. Again. Christmas in July bloggy gift exchange signup is here. If you are a blogger in Africa (or know someone who is), you should send them my way. We have one person from Africa signed up and want to keep shipping costs low for both her and her partner. If you're waiting on an email from me, I promise I'll get to it ASAP. 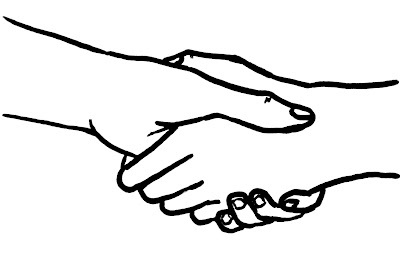 Generally, when I meet you, it is with a firm handshake. But excuse my french as I ask you what in the (okay, I can't bring myself to say "hell" because I pride myself on being family friendly, except I just said "hell" anyway, so it doesn't really matter, does it?) am I suppose to do when I'm leaving you? Example: Husband and I are in a choir (yes, it is packed full of old people, and yes, we sing old German folk songs, and yes, we love every second of it). Last night was our last night with said choir, so naturally we said goodbye. I listened to them sing this song to us (and wiped a tear or two from my eye - don't judge). As the song ended, though, I realized that I was going to have to say goodbye to each and every one of them. HOLY BALLS! What do I do? Do I hug them? Do I simply shake hands? Do I do both of the above? Do I do none of the above? Oh - too late - they're coming towards me. This thought process ended in awkward hugging all around. Oh, you're German and I don't know you very well? Let's hug it out. Oh, you just reached out for a handshake? Screw that - let's hug it out. Needless to say, all's well that ends well. I still don't know if I should have just stuck with a nice, cordial handshake, but I'm not too concerned about it. I love the Germans - really, I do. I may poke fun at their always-go-by-the-book-never-break-the-rules-five-minutes-early-is-really-five-minutes-late-I-think-you're-wrong-and-I'll-be-blunt-about-it-and-tell-you-to-your-face-while-I'm-eating-Schnitzel-and-bratwurst-and-drinking-beer ways, but I love them in spite of it all. I'm going to miss it here. In other news: We got our landlord issues worked out - we're coming home with only about 350 EUR less than we originally expected, which is nice. Thank you for all of your positive thoughts and prayers! Everything really does work out. Have you ever lived or traveled abroad? How the heck are you supposed to say goodbye to people? Alyx!!! This made me laugh. When I lived in Munich, and then I had to say goodbye, it ended at a beer garden with a lot of weissbeir and laughter (the Germans are surprisingly funny if you can get over the dry/serious don't break rules thing), and when I lived in England, it pretty much ended the same: a local pub, lots of beers.... both times, people were merrily drunk and hugging was easier for them all to handle :) Hope that helps! French fries in mayo?? What's the heart attack rate like in Germany? lol, the bain of my existance is living in nyc where EVERYONE KISSES/HUGs goodbye!! the kiss on the cheek. ughhh i am SO awkward! and last night i was at a retirement party and i saw people i hadn't seen in years or barely knew and i was like...am i still supposed to cheek kiss you?? literally, i am a creeep! bahahaha. I hate that awkward moment when you don't know which greeting to use. On another note, YOU'RE COMING HOME SOON! I love German people. I've only visited Germany once, but one of my neighbors growing up was a German family. I'm pretty OCD about things like punctuality, so maybe I was just meant to be German? But yes, saying goodbye to them is always a little awkward. No hints for you there. So glad your landlord issues worked out! I'm always awkward saying goodbye to EVERYONE. I never know whether to hug or just say "Okay bye!" or what. I'd have told you to hug.. I usually hug everyone back home (well unless it's a total stranger). Goodbyes are always kinda awkward!! Goodbyes are hard to do. Hugs for those you know and shakes for those you don't is usually my rule. What does "Oder" and "doch" mean? I LOVE that you and your hubby are in a choir, that's too cute!!! When we left Vietnam - we just tricked ourselves like we were going home for a long visit. We kept telling each other - we'll be back. However pulling out of our home for the last time was really sad. Man I have no advice for you. It just stinks. But enjoy the new adventure. hugging it out, not necessarily the worst decision you could have made. as a hearty american, i say, "i support you and your personal space invasion!" btw, it's pretty amazing that ya'll are in choir. it sorta just blew my mind actually. if we ever meet, i'll make you hug me WHILE singing in german. it'll be the most awkard thing you've ever done. Gosh...I like their outlook on time. I lived in Hawaii and "on time" was being an hour late...it was just a whatever kind of attitude, I'll get there when I get there. (annoying if you are really trying to stick to a schedule. I would have hugged it out too, haha. I live abroad now (I'm an American living in Australia) - the first time I went home was soooo hard...I had no idea how to say goodbye. I don't think there is any good answer really. It's always awkward and sad. Ugh. Awkward. It's like here in France, I never know whether to go for the kiss, handshake, or head nod. Glad the landlord issue worked itself out. Have a great weekend! I still can't bring myself to dip my french fries in mayo, and I only eat my pizza with a fork when it's too hot. I honestly didn't notice the Germans do that because I've only eaten in one pizza place and we were the only ones who had ours yet. Hurray I didn't look weird. LOL. This made me laugh. We actually have some good friends who live right outside of Frankfurt and I think this would make them chuckle. Yes I have traveled to Germany, Italy, Hungary and Austria and I thought Germans were stoic but Hungarians even more so. I noticed when I was in Germany there were some awkward social exchanges but I thought it was just me because I'm so overly friendly. Seriously, sometimes I think people have told me that I kinda scare them at first because I can be THAT friendly. This made me giggle. Oh hi, I"m new here. My name is Noël happy to be your newest follower. I can NOT stop giggling about this. Oh, you just reached out for a handshake? Screw that - let's hug it out. That's so something I would do. Only in reverse. Oh..you're coming in for a hug? Wait! Ugh. No. How bout a high five instead?? Come eat fries with me! I LOVE to dip them in mayo.